"Soft inside, but caramelized and a bit of a crunch outside! Yummy! 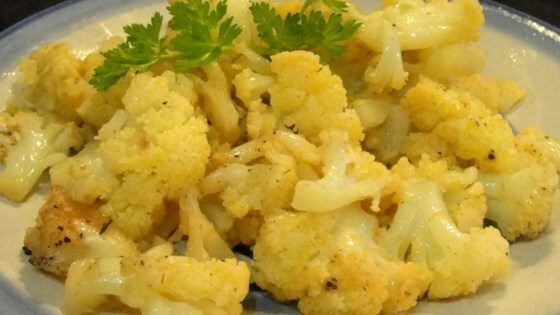 Changes the taste up enough for even cauliflower haters to come to the other side! My family loves it!" Preheat an oven to 500 degrees F (260 degrees C). Spray a baking sheet with cooking spray. Place cauliflower in a resealable plastic bag. Add olive oil, Cajun seasoning, and garlic salt to cauliflower; mix until evenly coated. Spread cauliflower in an even layer onto the baking sheet; season with salt. Cover cauliflower with aluminum foil. Roast in the preheated oven until cauliflower are slightly soft, 10 to 15 minutes. Remove foil and toss cauliflower with tongs. Continue roasting until cauliflower are browned and crispy, about 15 minutes. Roasting covered with foil in the high temperature steams the cauliflower before caramelizing the surfaces when the foil is removed.
. Way over cooked in time allotted. I liked the concept of Cajun flavoring. Would cook at a lower temperature just with Cajun seasoning and garlic powder. Add salt to taste afterwords.